aked Smar+ has a great idea, and it would have saved friends of mine numerous hours, or at times, days, of unintended and undesired "Super Surprised Stoned Sessions." Those sessions were brought on by people inadvertently consuming edibles made with cannabis, namely my extra strong cookies. Even though they were always placed in a container with dire, "End of Days" type warnings, containers get opened, and without a lid labeled that the contents are dosed, how is anyone going to distinguish a cannabis cookie from a civilian cookie? Answer: They won't, and then the bad times begin. Baked Smar+ is addressing this very real problem with its Cannacals Home Kits, and is extending this solution to dispensary purchased products as well. If making cookies, brownies or other home-baked goods, you pull off green crosses from a sheet, and place them onto parchment paper beneath your dough, putting the dough on top of the crosses. The finished edible from the oven now has a green cross on the bottom. It's made with FD&C-approved food colors, is gluten free, and orthodox Union Kosher certified, so maybe you bring your Bubbie some Canna-Hamantaschen? 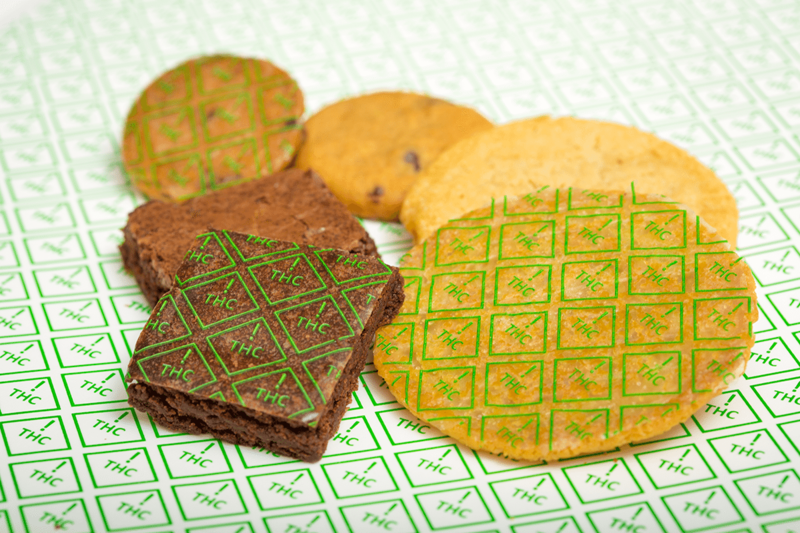 If you have dispensary purchased items but want to mark the edibles themselves, you can apply stickers directly to the baked goods or press a gummy, caramels or other sticky edibles onto a sheet of smaller crosses to affix it. Smar+, indeed. I still visibly wince when I see someone storing their flower in a plastic sandwich baggie. Glass jars are far better, but still let in light, which is not a friend to harvested buds. And with the sun-grown "Croptober" season nearly here, bud storage is at the forefront of many a grower's mind as well. I tried out a new storage device recently from CVault, and in this case C is not for "Cookie," or "Cuck." These units are well designed and effective on all counts—made from food grade stainless steel, they are solid yet lightweight, and come in a bowl shape, in various sizes. The stainless steel lid is attached by three latches, and has a thick silicone ring that provides an airtight seal. The interior of the lid has an ingenious feature that holds various sized packets of Boveda, the widely used humidity control product. Mine came with Boveda packs of 58 percent and 62 percent RH (relative humidity). I filled the small CVault that holds 7 to 12 grams with sticky buds recently acquired, and the Large CVault that holds 28 to 50 grams with an ounce and a half of 18-mont- old bud. The sticky bud stayed sticky, and the older bud softened in touch and taste. Various sizes and strong reviews make these a great choice for both consumer and producer. Cura Cannabis Solutions has a new line of vape pens that are CBD only (containing no THC) but do have an added proprietary blend of essential oils in three flavors, with three distinct intended effects. The pens are .500 mg disposable units that are labeled as "Relax," blended with lavender oil, "Focus," blended with peppermint oil, and "Revive," blended with grapefruit oil. The press packet explains in impressive detail the science behind the oils and the conditions which they are intended to address. I tried all three, and then passed them along to my OMMP patients with a need for the relief each pen is geared toward. I enjoyed the tasted the oils provided—no surprise as Select is known for a great tasting product line of THC cartridges. I didn't feel much from the CBD, but I rarely do. The noticeable effects of CBD are more subtle than THC, as in they don't get you stoned. The recipients of the pens gave me a thumbs up, especially those looking to avoid THC altogether. At one-half gram, they're small and discrete, and while I know there is a market for disposable pens, it would be great if there was an option for recycling these at area dispensaries.